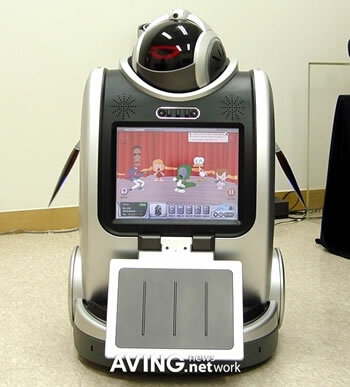 Yujin Robotics of Korea, among other companies, will be introducing nanny robots this fall. 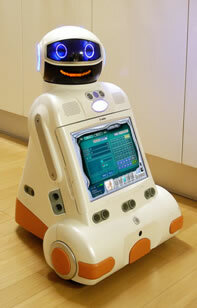 One such product, the iRobi, is described as an internet-based family robot. iRobi can take and edit photos, combine nursery rhymes with robot dances, provide fairy tale-based tutoring and even accept your custom programming. "We're in the early stages of the robot business. And for now, robots are just recognized as giving fun and curiosity. But I'm sure that the robot business will emerge as a major industrial trend in a few years, rendering substantial help to our daily lives." It appears that essentially the same robot is being tested under the name "Jupiter." Here's a look at this version. Jupiter has been used as a prototype since October of 2005 and has been tested in private homes in Korea. Yujin Robotics selected Northstar, an infrared LED technology from Evolution Robotics, as the means for robots to know their own location in real time. Northstar uses triangulation to determine position, based on spots of IR light projected onto visible surfaces. Each spot has a unique signature, providing robots with unambiguous positioning. Read more about robot nannies at AVING and Robot Gossip. Find out about robotic English teachers as well; don't forget about The Veldt, Ray Bradbury's original virtual reality childcare environment.